adidas Football kicks off its inaugural 2011 Shamrock Series with a limited edition Notre Dame pack. 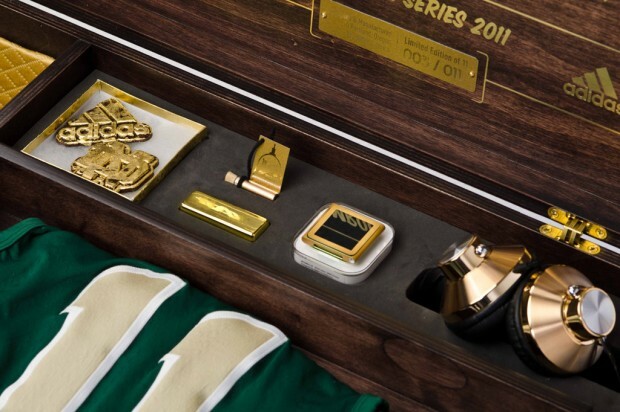 Alongside a new TechFit Jersey and adizero Swagger Gloves is an authentic Notre Dame helmet, covered in 24-carat gold leaf, featuring green shamrocks on each side, along with a leprechaun decal on the back. 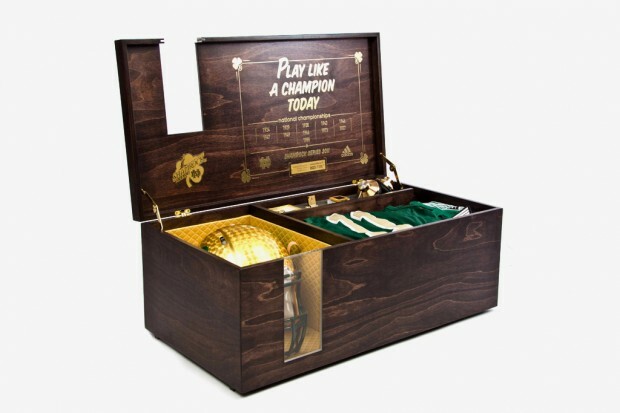 Handcrafted with meticulous detail, the helmet was designed specifically for the first game in the Shamrock Series against the University of Maryland, taking place on November 12. Additional goodies include a 16GB iPod Nano, Golden Dome Glass Vial, Artisanal Gilded Chocolates and an 8GB Flash Drive, with only 11 of these boxes being produced.